This would be the first time I was able to compete at the World Masters and I was not really sure how I would go, after the past few months, but I was really looking forward to some racing. 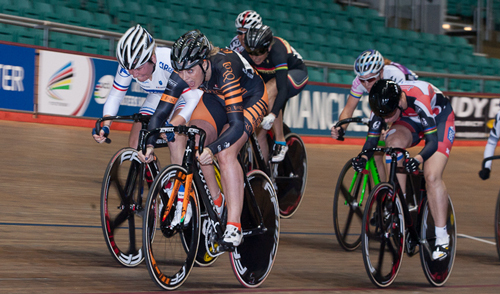 I travelled down on Saturday for my first event, the Individual 2km Pursuit, which was on Sunday morning. I arrived at the velodrome to catch up with Jan and David, whilst dropping off all the kit that comes with track cycling (which, believe me, is a lot!). After a brief catch up, I headed to my hotel, where I was staying for three days, after which I’d be staying with my Commonwealth Games partner in crime, Aileen McGlynn, for the rest of the week, and I hoped she’d learned to cook!! Arriving at the hotel, I was looking forward to chilling out, getting some food and having a piping hot bath to relax. However, those plans changed the moment I walked through the door to my room, because the place was like a furnace. It was so hot I opted for a cold bath instead. It is safe to say I didn’t get the best night’s sleep, but on the plus side, I must’ve lost about a stone in weight from sweating so much and that had to be good for my Pursuit, right?!! I headed to the velodrome on Sunday morning ready to smash the Pursuit. Actually, I was surprised to find that I was quite chilled out and not as nervous as I usually am; I was not sure if that was a good or bad thing? Warming up on the rollers, I felt good for a change and this was worrying, because usually my legs feel bad, but then they are OK once I am racing. After a good warm up, I was as ready to race as I was going to be. Waiting in the gate, I wasn’t sure what to expect? I knew I would love to ride a PB but the chances would be slim, as I hadn’t really done any specific training leading up to the pursuit. So I just rode my race and then was shocked to look up at the scoreboard and see I had ridden a PB, 3 seconds faster than I had ever gone before! I’m not quite sure how that happened, but I thought “I’ll take it!”. The time was good enough to qualify for the Gold medal ride off against Maddy Moore. Realistically, I knew Maddy would win, but I was going to give her a fight and I wanted to back up my ride from qualifying. Thankfully, I managed to achieve both of those aims and even took another second off my PB to take my first medal of the Championships with Silver. I didn’t have anything the following day, so headed to the velodrome to spin on the rollers and watch my team mates, Jan and Mel, get together with Maddy to ride in the team pursuit. I wasn’t riding this event, because I live too far away to get together with my teamies to train for it. Maddy, on the other hand, gets down to Newport and is an amazing pursuiter; she was the ideal choice. Mel, however, hadn’t been feeling that great, so there was a chance I might get hauled in to take her place at the last moment. This didn’t happen. They rode really well and they smashed the heats and then, in the final, rode a new World Masters record – amazing! 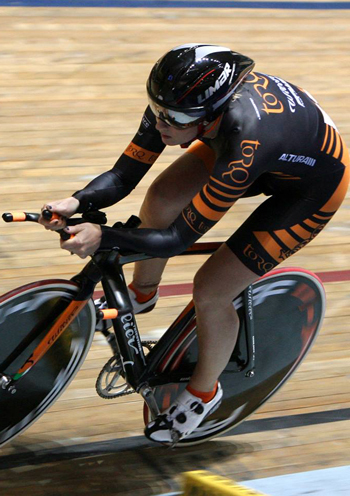 Tuesday was the day of the Scratch race and, secretly, this was an event I wanted to win. It is always a bit of a lottery and there were a number of women who could win, so why not me? In the past I have always seemed to end up in the wrong place at the wrong time, so I wanted to make sure I was out of trouble and not boxed in. So, with eight laps to go, I started making my way towards the front of the bunch and, with four to go, I realised I was right at the front. I did not really want to take it on so soon, but once I was there I did what I needed to stay at the front and match the speed of the others, who were trying to come around me. With two to go, I was still at the front and dropped down to the black line. I held the bunch off for a lap and then nailed the last lap. I had a French rider at my hip all the way and she tried to come over the top, but I managed to hold her off and I won my first Scratch race and a World Masters title – I was over the moon and even more so when my amazing team mate Jan also won her Scratch race too! Two races down and three to go, I had had an amazing start to these Championships. I just had to hope my form would hold for the remaining three races.